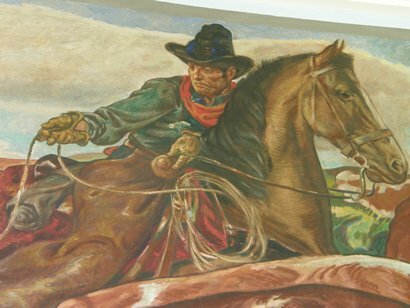 Purcell, Oklahoma Post Office Mural The Roundup by Frederick Conway. 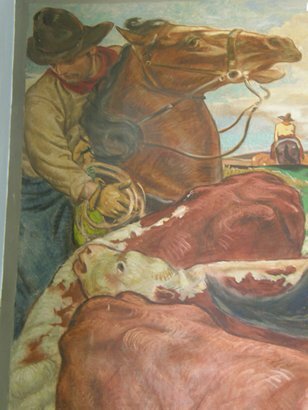 The Purcell post office mural remains in place where it was installed in 1940, however the installation was not as simple as it sounds. 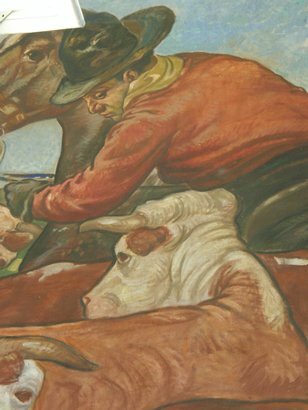 As explained in the excellent book Wall to Wall America: Post Office Murals in the Great Depression, author Karal Ann Marling gives the story of two artists, two murals, a judging committee and some very unhappy townspeople who voiced their preference (loudly) and got what they wanted. The judges declared that Purcell, Oklahoma and Jackson, Missouri “switch” muralists. 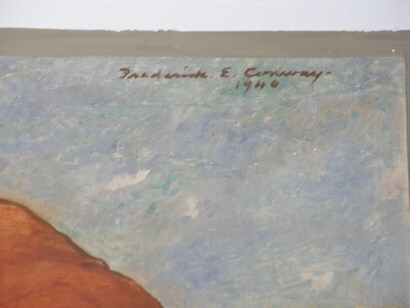 This was done, but eventually, Purcell, Oklahoma ended up with the mural shown here – a second work by Conway, not the original work involved in the controversy.